What if I told you that bigger is not always better? Many engineers know that this is the case when it comes to injection molding machines. Larger injection molding machinery is less portable, more difficult to house and typically requires more maintenance. If a machine exists with the same clamping force, half the footprint at a lower cost, why wouldn’t you use it? A superior design utilizing mechanical advantage makes this possible. In this blog we’ll show you how mechanical advantage works, and how the V-Mold can reduce the footprint and costs of plastic injection molding. 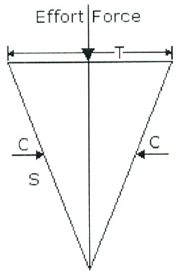 A wedge is an example of mechanical advantage, and the V-Mold utilized in vertical injection molding machinery is the perfect example of a wedge. The V-Mold can take an input force and nearly quadruple it to create the clamping force. It is quite simple how this happens. When the V-Mold is pressed into the mold shoes, it pushes the walls apart. However, since the walls are connected by large tie rods, they want to resist this force. 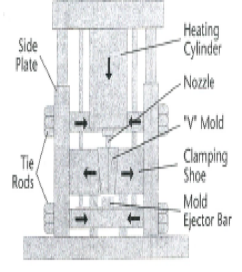 The tie rods act like springs, creating tension and pushing back against the mold, thus creating amplified clamping force in a benchtop injection molding machine. Due to the wedge design, the size of an Injection Molding Machine utilizing V-Mold technology is relativity small and often can be a benchtop injection molding machine. The V-Mold is also designed to allow for the mold to be changed quickly. This ability to quickly change molds is a big time saver compared to the fixed multi-cavity molds used in typical injection molding machines. Another advantage of the V-mold design is the ability to produce simple, low-cost tooling, thus reducing overall part production costs. V-Molds can easily accommodate tooling inserts, which facilitate rapid prototyping and low volume injection molding solutions. When utilizing a reciprocating screw the V-Mold Injection Molding Machine can provide all the performance of larger Injection Molding machines while minimizing the footprint, cost, and complexity of the vertical injection molding machine. Smaller and economical injection molding machines have many practical uses. They are commonly used for overmolding electrical cable assemblies and other low volume plastic injection molded production parts. Molding ASTM test specimens, and producing plastic prototypes parts are also very good applications for V-Mold technology in benchtop vertical injection molding machines. The V-Mold makes all of these uses practical and affordable.